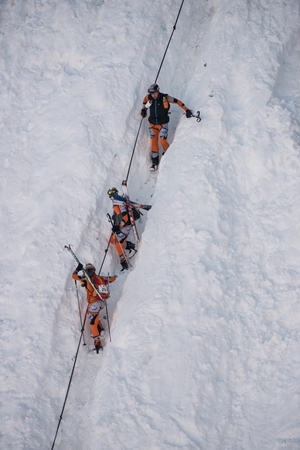 The Patrouille des Glaciers is regarded as the world’s toughest ski mountaineering race. This year’s event, which finished today, saw a clutch of records and firsts. 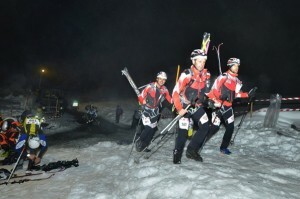 A Swiss-French women’s team knocked 14 minutes off the record previously set for an all-female patrol in 2010, completing the course in 7 hours 27 minutes. 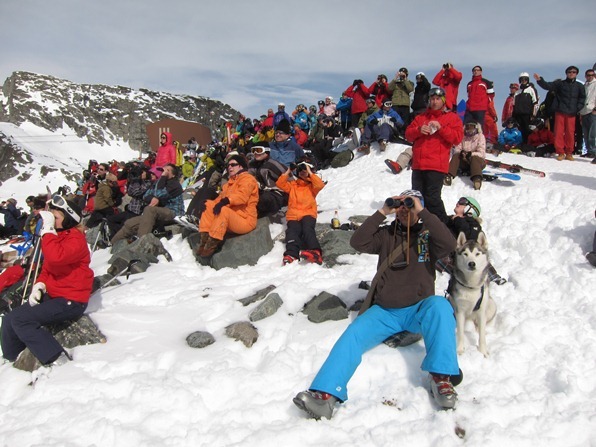 More than 4,900 skiers arrived at the finish line, more than ever before. This year’s event also saw the launch of a “Patrouille des jeunes”, for young people aged 14 to 19. 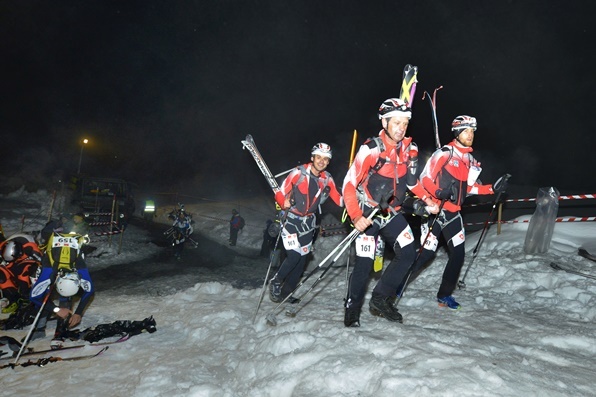 The ski mountaineering competition has been likened to racing two marathons, back-to-back – with the additional challenges of competing at night and climbing to altitudes of more than 3,600 metres. 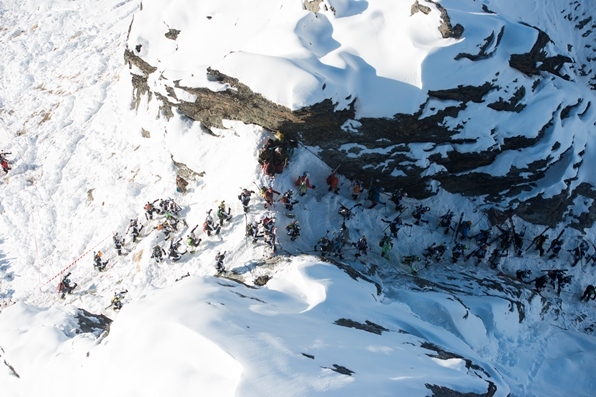 The full course, from Zermatt to Verbier, involves nearly 4,000 vertical metres of climb over a distance of 53 km, with departures from Zermatt staggered at intervals, starting at 9pm. The “petite” Patrouille follows the second half of the route, starting in Arolla, with nearly 1,900 vertical metres of climb over a distance of 26 km, and staggered departures starting at 3.30am. The 2014 competition was the 30th anniversary of the race in its modern form. Over the years, the biannual event has attracted so many entrants that racers now compete in two batches, a few days apart. However, the weather has to play along: in 2012, organisers interrupted the race at Arolla because they considered the snowpack too unstable. For the whole week of the event, Patrouille fever grips the Valais. Local TV runs extensive coverage every evening, with detailed speculation about weather and snow conditions. This year, unstable weather and fresh snowfalls forced the organisers to postpone each leg by 24 hours. The competition is open to patrols of three, who have to cross the finish line together. Anyone can enter, although you must be able to prove you have what it takes to complete the course. 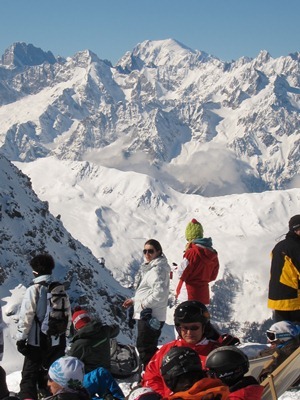 You have be a keen ski tourer who has already taken part in mountaineering competitions, be an excellent skier, have a high level of fitness – and have experience of skiing downhill, roped-up in a team. That’s in case one of your team falls down a crevasse as you ski across a glacier. The risk is genuine: an entire patrol fell into a crevasse on the Mont Miné Glacier during the race in 1949, and their bodies were not recovered until eight days later. After the tragedy, the event was cancelled altogether – only to be resurrected in its present form, 30 years later. 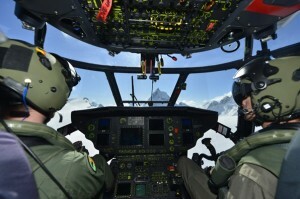 The Swiss Army devised the race during the Second World War as a way of testing the operational readiness of its troops in high-altitude terrain along the country’s south-eastern border. 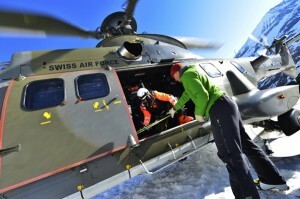 The course: the famous Haute Route between Zermatt and Verbier, for which ski tourers normally allow four days. Of the 18 patrols that entered the first race in 1943, only two crossed the finish line intact. Today, the contest is open to civilians as well as the military. Interest is greater than ever: even though the Swiss Army increased the maximum number of patrols this year by 400 to 1,800 – male, female and mixed – it had to turn away nearly 1,500 would-be racers. In all, the 2014 race featured teams from 29 nations including Britain, Canada, USA, China, Singapore, South Africa and the United Arab Emirates, with patrols from ten foreign armies. About one sixth of racers were women. The route from Zermatt begins with a gruelling climb to the highest point of the whole course, the Tête Blanche at nearly 3,700 metres. During the first race this week, the temperature here was -9C at 2am – with wind chill, equivalent to -17C. The course then leads via the Col de Bertol to the resort of Arolla, starting point for those competing in the “petite” Patrouille. From here, racers skin up to the Col de Riedmatten before skiing down to the Lac des Dix and then climbing back up to the Rosablanche before the long descent to Verbier. The race is a great spectacle for non-participants, too. One of the most impressive viewpoints is the top of the Mont-Fort, the highest point in the Verbier/Four Valleys ski area (3,330 m). From here, the patrollers crossing the vast snowfields on the flanks of the Rosablanche appear like microscopic specks, dwarfed by the sea of snowy peaks that stretches to the horizon. The racers face one short climb up to the Col de la Chaux before their long final downhill: along the foot of the Bec des Rosses (site of the Xtreme Verbier in March, finals of the Freeride World Tour), joining the red piste that runs from Les Gentianes and under the Jumbo cable car to La Chaux, and through the forests below Les Ruinettes down to Verbier. 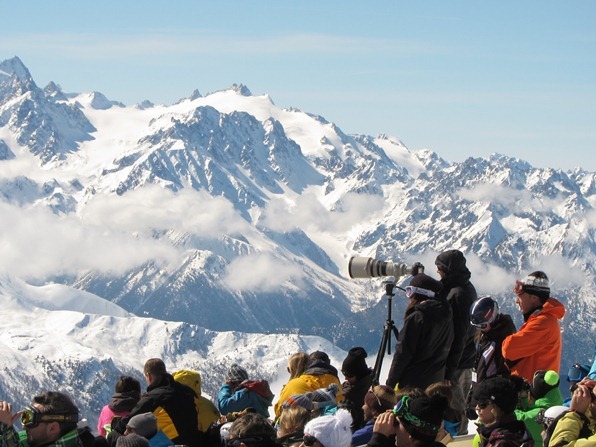 The second day of the race, Sunday 4 May, was also the final day of Verbier’s ski season – but these lower pistes closed to leisure skiers days ago, through lack of snow. Spectators, even those on skis, rode down on the gondola instead – while the racers in the forest below skied on every last patch of snow they could find before taking their skis off and running through the mud, still in their ski boots. From Médran, about 1.5 km of shopping street separated them from the finish line. Husbands, wives and children waving placards and balloons cheered on the competitors as they ran, walked, lurched and hobbled to the finish. Out of 1,715 patrols that started the race in two batches, all but 78 made it to the finish line – and if conversations overheard there are anything to go by, most are already dreaming of 2016. Britain now has a snowboarding speed record, thanks to 20-year-old Jamie Barrow, a student at Bath University. 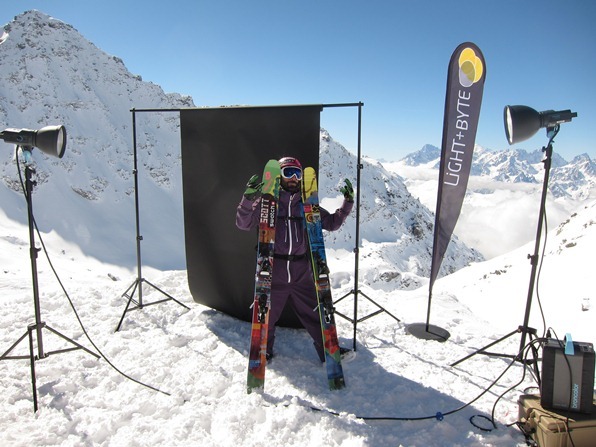 As Jamie rode out of the speed trap at the bottom of the Glacier de Tortin on Thursday morning in the Swiss ski resort of Verbier, he realised he had fulfilled a dream. 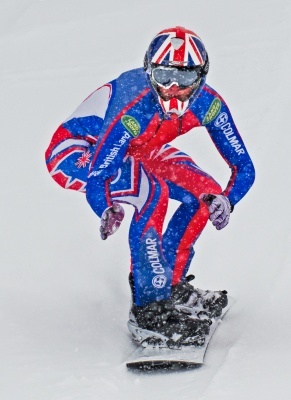 Until this week, there had been no official British snowboarding speed record. The world record, meanwhile, stands at 201.907 km/h, set by the Australian snowboarder Darren Powell at Les Arcs in France in 1999. As soon as he had set his record, Barrow knew he could break it. “I wasn’t quite fully tucked in, I know I can go back and do it faster,” he said. And he set off back up the glacier, to beat the target he had just set. 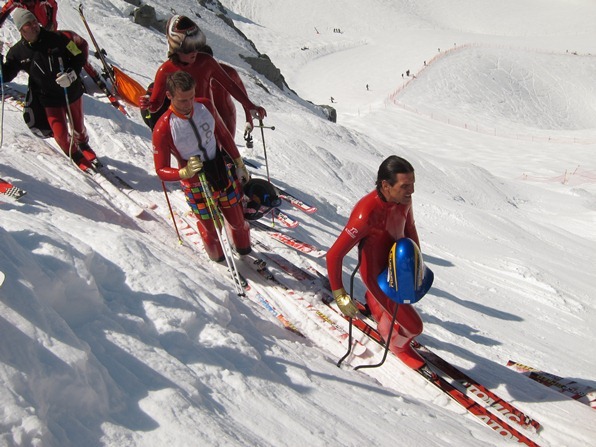 Barrow’s record attempts took place during XSpeedSki, an annual celebration of speed on snow held on the slopes of the Mont-Fort in Verbier. The Speedmaster contest, held straight after the FIS Speed Ski World Cup, offers athletes like Barrow the chance to test themselves to the limit. Only after his first run did he learn that, according to the rules, his next run would have to start from higher up the glacier. At first he was apprehensive. 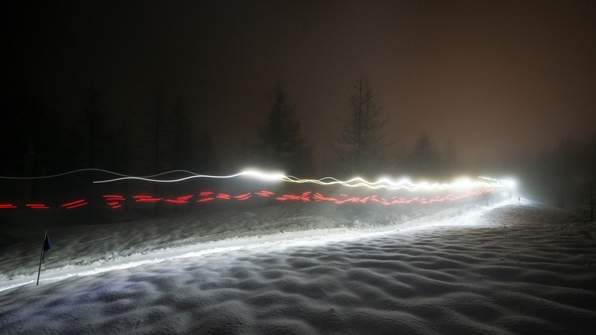 The run may appear to spectators as smooth as an ice rink, but taken at speed it’s “a little bit bumpy”, according to Barrow, scattered with “death cookies, as we call them”. When you’re travelling at a speed that would earn you a ticket on many of Europe’s motorways, you don’t want to fall. It would be bad enough on skis, fitted with safety bindings; if you tumbled at that speed while strapped onto a snowboard, the consequences do not bear thinking about. See our video interview with him after his first run. The location for his challenges will be familiar to any skier or snowboarder who has visited the resorts of Verbier or Nendaz: the slopes of the Mont-Fort, at 3,330 metres, the summit of the whole 4 Valleys ski area in the Swiss Valais. The views from the top station of the cable car are spectacular, taking in Mont Blanc, the Matterhorn, countless glacier-draped peaks, and extending across the Swiss Plateau to the Jura Mountains in the distance. This is the starting point for some of Verbier’s celebrated off-piste runs, as well as the entry point to a steep mogul field that has confounded many an intermediate skier and snowboarder. From the platform of the cable car station, you also have a stomach-churning view onto the speed skiing run that has been the venue for this week’s FIS Speed Ski World Cup, a super-smooth sheet of hard-packed snow, as blank and featureless as a funeral shroud. At the age of 20, Barrow has already had a few brushes with injury. He currently has a slipped disc in his back, and has previously suffered from a slipped disc in his neck and concussions “more times than I can count”. These, however, were all a result of boarder cross, Barrow’s main discipline: he is a member of the British snowboard cross team, and was British junior champion from 2009 to 2011. 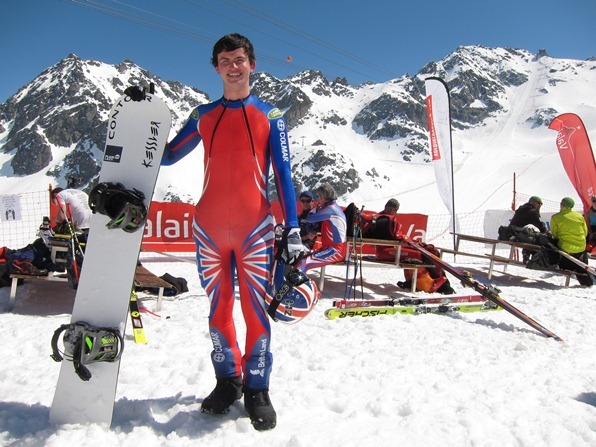 He has had to drop out of the competition because of his slipped disc, but if his injury improves he says he’d like to get back into boarder cross – “and hopefully compete for my country at the next Winter Olympic Games”. In the meantime he has other ambitions, all relating to going very fast. “I still want to break the 100 mph [160.93 km/h] barrier,” he says, as well as “set the world record for being towed by a snowmobile – and maybe even for being towed by a small plane.” He is also planning to tackle the world indoor snowboarding speed record – in Holland. 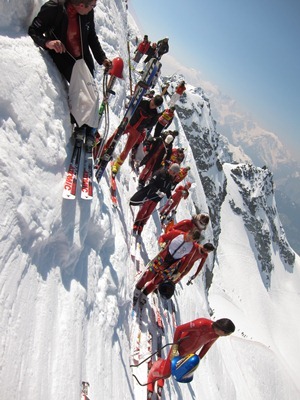 Up on the glacier on the Mont-Fort, meanwhile, the high start of the run – the highest ever – allowed several skiers to exceed the existing course record, including Philippe May. By the end of the day, Simone Origone’s speed of 225.820 km/h had become the new course record. Snow conditions did not, however, allow for the use of the special ramp erected at the start of the run in a bid to smash the world speed ski record of 251.40 km/h, set by Origone in 2006. The weather forecast for the next few days is not promising: a new world record may have to wait another year. A red blur streaks down the glacier and through a speed trap, clocking up nearly 220 km/h. The aerodynamic blob unfolds to reveal a skier in a red skin-tight suit, sporting a Darth Vader helmet and a pair of skis nearly 2.40 metres long. A vision of winter sports to come, perhaps, viewed through the lens of science fiction? No, this is now: welcome to the surreal world of speed skiing. At the end of every season, devotees of one of the stranger forms of winter sports gather in the Swiss resort of Verbier to celebrate their discipline on the slopes of the 3,330-metre Mont-Fort. This is the fastest and arguably purest form of ski racing: you simply point your skis straight down the mountain, tuck your body into as aerodynamic a shape as possible, and rocket as fast as you can through the speed trap at the bottom. One of the highlights of the gathering is the finals of the FIS Speed Ski World Cup, which finished on Wednesday [April 17]. First place went to Simone Origone of Italy, who also won the overall rankings, clocking up a top speed of 217.010 km/h. The celebration of speed skiing continues over the next couple of days with a pro race and speed masters contest. 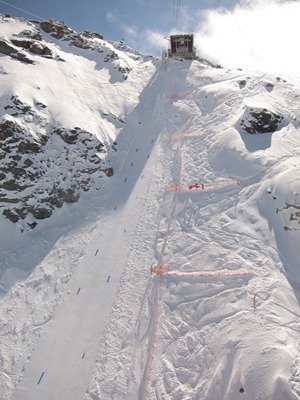 Climax will be an attempt to break the current speed skiing world record of 251.40 km/h, set by Origone in 2006. 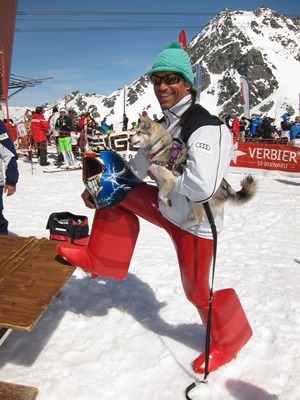 Among the challengers is the local speed skier Philippe May, one of just five people in the world ever to have skied at 250km/h. What on earth does it feel like, I asked? The best athletes can exceed the speed of a plane on take-off, and accelerate as quickly as a Formula 1 car, going from 0 to 200 km/h in less than six seconds. Unlike Formula 1 cars, speed skiers are not allowed any aerodynamic gimmicks to keep them on the ground: “the only spoiler is your body”, says May. To reduce drag, racers attach fairings to their lower legs; covering everything is a red, skin-tight suit that is 100 per cent air-tight. An aerodynamic helmet completes the surreal, futuristic look. The races take place on the Glacier de Tortin, on a vertiginously steep run smoothed hard and flat like a sheet of white marble. The skiers slice through the air, the sound echoing around the surrounding cliffs, and leaving a swirl of dusty snow in their wake like a vapour trail. The key to success, says May, is an efficient racing tuck – one that he practises regularly in a wind tunnel housed in a disused underground railway tunnel in Geneva, run by the city’s School of Engineers. Once through the speed trap, the racers rise slowly, in order not to be thrown backwards by the rush of air. The track may look smooth to spectators, but even the most carefully groomed piste has undulations. “It’s not flat,” says May, “it’s a mountain, and it’s alive, so it feels as if it has waves.” A slight drop in pitch, says May, can send you airborne for 70 metres. At this speed, the slightest movement of air can have devastating consequences – as May found out at an event at the Italian resort of Cervinia in 2003. “At high speed you don’t weigh anything,” says May. A slight gust of wind blew him off the track. He shot through the netting – “I weighed 85kg, and when I went through the net at 160 km/h, it didn’t even slow me down” – and broke seven ribs and a shoulder blade. Breakages are not the commonest injury among speed skiers, however. If they fall, they usually just slide down the track. “The suits we wear are 100 per cent windproof, it’s like wearing a plastic bag – so you never slow down.” The result: third-degree burns, from friction with the snow. James Bedding caught up with Philippe May and talks about his sport. And the final question … Why do you do it? Fear of falling will not be putting off May and other competitors from attempting to set new records over the coming days. They are hoping to make use of a special ramp that extends from the summit station of the Mont-Fort cable car to the top of the glacier, flown in by helicopter a couple of winters ago, but not used in previous seasons because of insufficient snow. Thanks to abundant snowfalls this winter, May and his fellow speed skiers hope to be able to inaugurate the ramp over the next couple of days. They estimate that by the time they reach the bottom of the ramp, pitched at a stomach-churningly steep 60 degrees, they should already be travelling at about 120 km/h.